Solid Waste Management – Official website of Anandvan Mitra Mandal , Registered office Pune,Maharashtra. 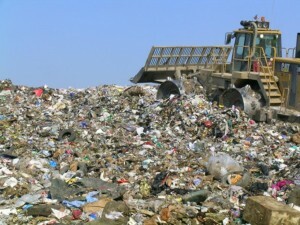 Solid Waste Management: Its causes, effects and control. Indian is fast turning urban with very few rural pockets remaining villages any longer. Size of population, upward mobility and monetary gains have made most of us an urban population with similar buying and spending propensities. With production capacities getting a fillip in the form of either new or upgrades, India is seeing a boom like never before. Be it FMCG, infrastructure, edibles or even hard-core projects, every sector is witnessing rapid expansion the likes of which Indians have never seen before. While this is a long-due welcome phenomenon, what is worrisome is the scant regard being paid to the waste being generated by these industries. Natural resources like earth/ mud, trees and the likes have not been able to keep up with the quick and large scale of demand have long been replaced by most industries with plastics, synthetics and other manufactured materials. Most do a good job and are quite durable; so durable that in fact in some cases they perform better than the original and herein lies the problem. How do you dispose of plastics and synthetics durable that they are withour severely harming the environment? – Industrial wastes : which in most cases are by-products or end-product of process and manufacturing industries. These in most cases are taken care of by the releasing industries itself and sometimes if anything valuable is available therein becomes feedstock for downstream industries. A perfect example is the petroleum industry where practically nothing gets left out in the distillation process. Each and every waste-product including sludge gets used given its high hydrocarbon content. The other kinds of industrial waste come from the construction industry where existing structures are pulled down to build new ones. 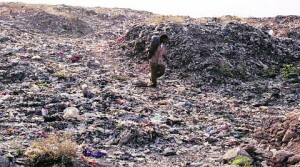 Still others are mining waste, sewer sludge and agricultural waste. All these in one form or the other are taken care of and disposed safely. 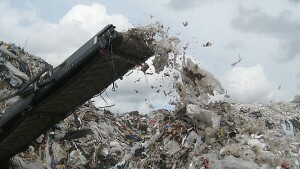 – Municipal Solid Waste (MSWs) which gets generated in homes, offices, institutions and certain people-heavy industries. These mostly consist of food waste and dry garbage like paper, plastics, glass, metal and wooden rejects etc. – Reduction in usage: Even the simple act of not asking for fresh polythene bags while shopping can where done by the sizable portion of the population, reduce its usage and disposal to a large extent. Where implemented in right earnest by all, this can result in massive reduction in MSW. – Re-use and re-cycle to the extent possible. Most of MSWs are finished products which can with minimal changes be used elsewhere with equal if not more efficiency and ease of use. By such redirection and minimum re-cycling, multiple objectives can be achieved at reduced costs and low wastage. Prime examples are the recycling of crushed glass and paper where close to 50% cost reduction can be achieved by re-cycling. This may not be applicable in each and every initiative, like for example the reuse of paper which makes it more expensive than virgin paper. Plastics too can be re-cycled but with care given that they can pollute badly if not handled properly. o Methane formed when organic de-composition takes places needs to be safely evacuated. If not, you are sitting on a time-bomb ticking away fast. o A permanent stench pervades the air and the entire vicinity is rendered uninhabitable due to the plant if not handled carefully. 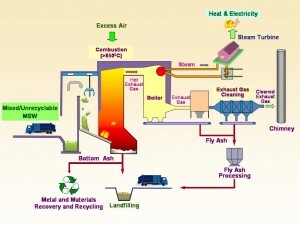 – Incineration : The process of burning MSW in a controlled condition in specially designed furnaces is called incineration. Its main advantage is that it reduces the volume of waste by 90% and weight by 75%. Though burning seems to most Indians to be the ideal option to put an end to MSW, what most do not understand is that this is a capital-heavy process which needs to be done under strict supervision to prevent pollutants from entering the process and causing untold miseries. Segregation of MSW into combustible and non-combustible is at the core of the process. Not all MSW is combustible. While paper burns easily, laminated paper poses a problem due to the layer of plastics on the paper and may be termed non-combustible. India may not be the most ideal of places to implement this technology given our penchant of burning everything and anything without giving a thought to the environment. Another problem is the by-product like gases released during incineration as also the ash generated. These too may pose a problem if not handled with care. 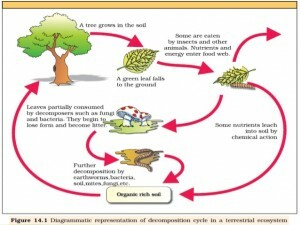 – Organic decomposition. Also called Vermi-composting, it involves the use of natural agents like inspects, worms and bacteria to dispose off organic waste. Essentially it involves mimicking what nature has always been doing when disposing off natural stuff like leaves, trees, branches, foods, etc. What gets left behind after the process is over is a dark, soil-like nutrient-rich material called compost which is alive with natural nutrients for natural growth of plants and trees. Compost also enhances the soil fertility of farms, fields and gardens. The pit thus dug or the vessel needs to be lined with natural stuff like leaves, twigs and straw. Every fortnight, churn the contents of the pit/ vessel. Where done religiously, a month to 45 days from the beginning of this process the waste would be completely decomposed by the micro-organisms and what would remain in the pit/ vessel is nutrient-rick soil!